Our series on green chemistry continues with an exploration of how we at Janssen approach and activate these vital principles. 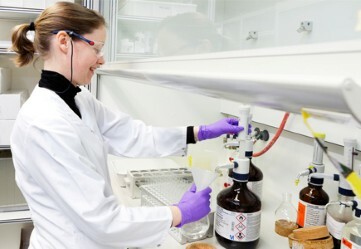 Click here for a primer on green chemistry, and watch this space for additional features on how our laboratories and manufacturing facilities are leveraging green chemistry for both environmental and business benefits. Janssen is committed to living the principles of green chemistry, making smart choices to minimize or eliminate environmental impacts wherever we can. We do this by routinely evaluating the environmental footprint of our products including the energy, materials, and water used during the product lifecycle, and by applying the 12 Principles of Green Chemistry to our pharmaceutical processes. We focus on designing and manufacturing more sustainable products and solutions to create a healthy future by incorporating green chemistry and technologies into our product lifecycle, from design to manufacturing to disposal. We’re proud to conserve energy and water use, eliminate or reduce hazardous materials, improve and increase sustainable and renewable resources, and limit waste, while working to solve some of the most important unmet medical needs of our time. While the concept of green chemistry is gaining momentum now, it’s not new to us. More than two decades ago, Janssen began working to remove toxic chemicals from its processes. We publically reported our progress as part of the Johnson & Johnson 1993-2000 Pollution Prevention Goals, demonstrating significant progress in sustainability in areas including energy, water, packaging, toxic chemicals, hazardous waste generation, solid waste disposal, recycling, and wastewater disposal. As part of this project, Janssen adopted a version of the U.S. Environmental Protection Agency’s Design for the Environment tool to help identify chemicals of concern and substitute more environmentally friendly chemicals. Through our Janssen Sustainability Council, formed in 2009, our leaders encouraged further development and deeper integration of green chemistry and technologies, as part of our sustainability efforts, across our Research and Development and Supply Chain organizations. Since its 2012 inception, we have participated in the European CHEM21 program, a collaboration among five European pharmaceutical companies and 13 academic partners. It is intended to become a European research hub and center of excellence for information and training on best practices in green chemistry. Janssen, representing Johnson & Johnson, is also a founding member of the American Chemical Society’s Green Chemistry Institute Pharmaceutical Roundtable (ACS-GCIPR), which also intends to inform and catalyze green chemistry research and education. Receiving recognition for our work reinforces the value of our efforts – and, of course, makes us feel great. Johnson & Johnson has received many international honors for its sustainability efforts, such as being named to the Interbrand/Deloitte list of Top 50 Green Brands every year from 2011 to 2014. In all, eight Janssen products so far have completed the rigorous EARTHWARDS® program. Each has yielded benefits, such as increased renewable energy use; reductions in water, raw materials, packaging, and hazardous waste; and improved yields.